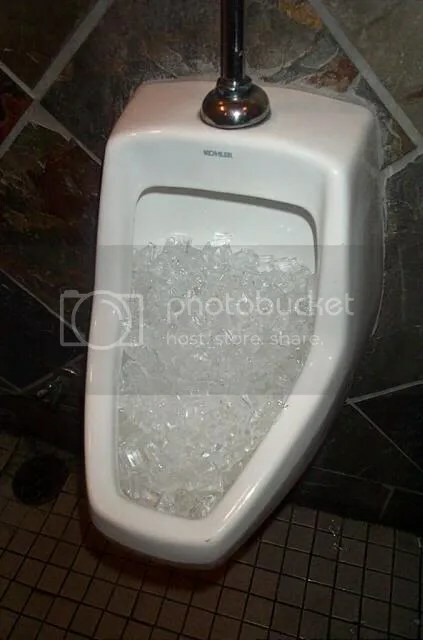 Many of the eateries and bars these days put ice in the urinals. At first I thought they were crystals/glass pieces designed to improve the beauty of the bathroom. However it took me some time to realize how ingenious this idea is. Hardly anybody flushes after using a public urinal (probably it was never a part of their potty training) hence many establishments tried with automatic flushing systems with IR proximity sensors. However they are prone to fail and the whole toilet stinks when even one of them does. Periodic manual/timer based flushing (the older technology) does not adjust with the changing patron usage patterns. Hence the ice makes perfect sense. The melting ice acts as a slow, continuous flush. Since the urine is warm, the more people use the urinal more flushing happens. Ice cools the air around the urinal. Since cool air flows down, it further helps in containing the smell. Also the chill of the ice discourages flies and cockroaches to approach the urinal. I have also heard of the marker system and how everyone unconsciously aims at it. However except for a few places where it was because of bad housekeeping, i have not seen it actually being used.